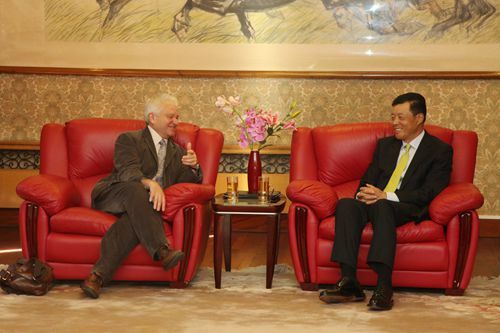 On 2 September, Ambassador Liu Xiaoming met with President of the Royal Society, Sir Paul Nurse, who was planning to visit China soon. Minister Counsellor of the Science and Technology Section of the Chinese Embassy in the UK Chen Futao and Executive Director of the Royal Society Dr Julie Maxton attended the meeting. Sir Paul Nurse said that he was looking forward to visiting China. Talking about his first visit to China, Sir Paul Nurse expressed the hope that he would be able to make extensive contacts and in-depth exchanges with Chinese researchers and educators, so as to further promote cooperation between the two sides in the relevant fields. Ambassador Liu said that scientific cooperation is one of the most important fields in China-UK relations. The UK is the third largest scientific partner of China, while China is the fourth scientific partner of the UK. There is unlimited potential in scientific cooperation between China and the UK. He expressed the hope that scientists from the two countries would strengthen exchanges and expand the bilateral cooperation so as to push forward scientific cooperation and make contribution to the growth of China-UK relations. Sir Paul Nurse agreed with Ambassador Liu’s proposal on further strengthening scientific cooperation between the two countries. He said that the Royal Society would enhance the exchanges and cooperation with the Chinese scientific community in strategic planning and other specific areas and bring into full play the role of the scientific community in promoting UK-China relations.